Snowberries are harvested from the snowberry plant, which is commonly found near the snowline. 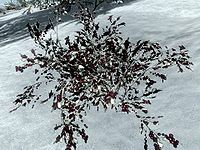 Snowberries are the only ingredient which has all three resist elemental effects: fire, frost and shock. Snowberries are also categorized as food, meaning they can be sold to innkeepers as well as apothecary merchants. In addition to alchemy, they are used in baking the Snowberry CrostataHF and the Lavender DumplingHF. This page was last modified on 9 April 2018, at 06:24.